Feline leukaemia (FELV) is a disease of cats caused by a virus called a retrovirus. It is called a retrovirus because of the method it uses to replicate inside the cat. It is the same type of virus as the human immunodeficiency virus and although there are a lot of disease similarities, several studies have shown that the disease is not transmissible to humans. FeLV is one of the most dangerous diseases that affect cats and is a major cause of death in cats. Fortunately the prevalence of the disease has decreased in recent years due to the use of vaccines against the disease and the ability of vets to diagnose the disease early and accurately. How do cats contract Feline Leukaemia? The disease is more prevalent in cats between one and six years of age and is more often seen in males than females. The virus is present in high quantities in the saliva of an infected cat, but also in smaller quantities in the stool and urine. The virus gets transmitted through cats biting each other as well as through grooming each other. In a few circumstances it can also spread between cats by sharing food and water dishes. It can also be transmitted from the mother to a foetus inside the womb, as well as through milk from the queen to the kitten once the kittens are born. If one considers the way the virus spreads it should be clear that multi-cat households will be more affected than single cat households. Cats that roam outdoors are also more exposed in terms of getting into contact with other infected cats. If your cat is infected with Feline Leukaemia at an age younger than 8 months it is most likely that the disease was contracted from the mother. If a cat gets sick with Feline Leukaemia after 8 months of age it is more likely that the infection was contracted from other cats in the household or roaming cats. What does Feline Leukaemia do? Not all cats that get infected with the FeLV virus develop severe disease. With initial infection the cat’s immune system may fight the virus and get rid of it completely. In other circumstances the cat’s immune response is not adequate and the virus infects tissues like lymph nodes and the bone marrow. The virus can lie dormant in these cells for years, not causing disease but if the cat is stressed or the immune system challenged, the virus may start replicating and cause full blown and serious disease. There are four different subgroups of the virus causing different disease processes in the cat’s body. A cat can be infected with one, two or all four of the different types. 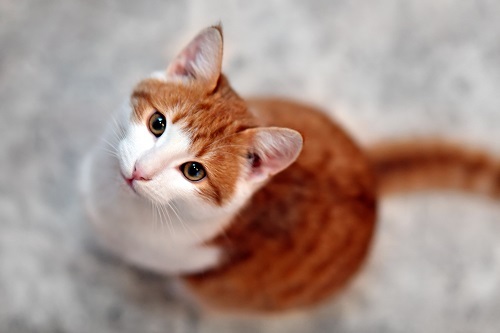 The different types are called FeLV-A, FeLV-B, FeLV-C and FeLV-T. FeLV-A is found in almost all naturally infected cats and tends to be less severe disease than viruses of the other subgroups. FeLV-B causes cancer in cats and occurs in about 50% of cats with FeLV. FeLV-C affects the bone marrow and red blood cells and can cause severe anaemia or low red blood cell count. FeLV-T causes a severe drop in immunity because it destroys white blood cells called T-lymhpocytes which play an important role in the defence mechanisms of the cat’s body. The clinical signs which cats will show depend on what type of subgroup virus it is infected with. The signs seen most often are loss of appetite or anorexia, depression, weight loss, unexplained fever, poor coat, infections in the mouth like gingivitis (or gum infection), eye infections, diarrhoea and enlarged lymphnodes. Typically the virus causes a slow deterioration of the cat’s health over a number of months. Owners will often notice that the cat will be more listless, skip meals more often and show slow weight loss. The cat will have minor ailments more often due to the decreased immune system and will need to be taken to the vet more often. These symptoms will alert the vet to test for this virus. How is Feline Leukaemia diagnosed? Fortunately we live in an age where there are much more efficient methods to diagnose FeLV now than in the past. It can be done with a simple test at the vet, called a FELV snap test or Elisa test. All that is required for this test is for the vets to take a small blood sample from the cat and do the test with the results being available within a few minutes. If the results are not clear or definitive or if one needs to know what stage the infection is in, another test can be done at a laboratory for which blood needs to be sent away. This test is called an IFA or immunofluorescence assay test. It is important to realise that other common infections needs to be ruled out first. A full blood count and organ function test will often be done at the same time as this will provide the vet with information on how the virus has affected the different body systems at the time of making the diagnosis. It will also serve as a reference point for future monitoring of the disease to see how the virus progresses and may serve as a prognostic indicator. Sadly there is no cure for full blown Feline Leukaemia. Cats can only be treated symptomatically and made as comfortable for as long as possible. Infected cats will need extra attention and need to be taken to the vet more frequently for regular health checks. Their basic health care like deworming, flea treatment and vaccinations needs to be done regularly. With regular vet visits the vet can pick up any problems early and start treatment as soon as possible. Regular blood tests should be done to determine deterioration as early as possible. It is recommended to visits the vet at least every 6 months if your cat is diagnosed with FeLV infection. Because the immune system of affected cats is compromised, these cats may often require treatment with antibiotics for secondary bacterial infections. It is important to give antibiotics for at least 7 to 14 days to prevent the build-up of antibiotic resistance. Blood transfusions can be given to anaemic patients and chemotherapy is an option for cats with cancer. It is important to remember that these treatments do not provide a cure, but alleviates the symptoms of the disease to some extent and make life more comfortable for infected cats. Unfortunately 85% of persistently infected cats die within 3 years of being diagnosed. Infected cats should always be placed on a good quality diet. Never feed a raw diet as this can introduce infections. They should be kept indoors to protect them from any infections but also to prevent the spreading of the disease to other cats. FeLV infected cats should be kept as stress free as possible. They also tend to do better in a single-cat household rather than in a multi-cat household. Never introduce a new cat into the household with an already infected cat, as this may lead to increased stress and fighting and transfer of the disease. How to prevent healthy cats from getting infected with FeLV? The most important method to prevent infection is to keep cats indoors and not let them roam. There are also vaccinations available against FeLV. Before having your cat vaccinated, you have to have them tested for FeLV first. When introducing a new cat into the household, always have them tested for FeLV beforehand. When one of the cats in a multicat household is diagnosed with FeLV, have all the cats tested and vaccinate all the unaffected cats. There has been no benefit shown to vaccinate an already infected cat. If at all possible it will always be beneficial to separate an infected cat from other cats. Feline Leukaemia may be a terrible disease but it is by no means an immediate death sentence when a cat is diagnosed with the disease. With modern advances in veterinary medicine and care, infected cats can live a good quality life for years after they were initially diagnosed.